We must work ceaselessly to help those oppressed by the communists, and at the same time to win the communists and atheists for Christ. We must also awaken our fellow Christians and those of other religions (A Ransom for Wurmbrand, 126). There is only one way to do this: by allowing ourselves to be so filled with the Spirit of our Lord and Master in every part of our lives that we cannot fail to draw many after us (126). Is the task of the many, the small, the weak, the insignificant, whose duty it is simply to get on with the job which lies to hand. God used me, one of His smallest, to ransom the Wurmbrands. In their turn, they, two of His giants, have been used by Him to start a might work whose results cannot be calculated this side of Heaven (126). The work of Voice of the Martyrs is not meant only for leaders like Rev. Wurmbrand or Rev. Foley, but it’s meant for you and me. And the challenging and inspiring stories of the martyrs are not meant only to be read by folks like us, but they are meant to teach us obedience, faithfulness and boldness. That is true in both the lives of the giants and the small, the weak, and the insignificant. This entry was posted in persecution and tagged A Ransom for Wurmbrand, Rev. 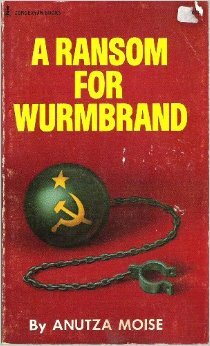 Richard Wurmbrand, Sabina Wurmbrand. Bookmark the permalink. Agreed…I’ve been lingering in Acts 17 lately. God determined the times and places where all men should live. He places each of us geographically, professionally, and at the exact time so we will look for Him, find Him and then fulfil a specific service for His glory. This lady definitely fulfilled her good work.